Grand Circuit Raceway lets want-to-be drivers of almost any age get behind the wheel of a real gas powered car—no license required. The cars are much smaller in scale than a regular street vehicle (read: go-carts), and seat two people; as is the case with the rest of the cars in Japan, the steering wheel is on the right side of the car. Although you actually do steer the car, there is a rail in the middle of the track so you can't sideswipe the car next to you or make a hard right turn over the grass and drive around Tokyo Disneyland (which might actually be fun if the park wasn't so crowded). You also control the gas pedal, but there is no brake pedal—when you take your foot off the gas pedal, the brake engages automatically. The track itself is roughly a figure-8 shape, and the trip around the raceway takes about 5 minutes. 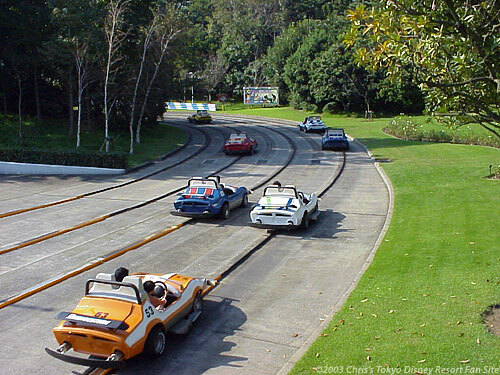 Disneyland in America has its own version of this attraction, called the Autopia. It's interesting to note that in America, a lot of kids (and adults for that matter) seem to get their kicks by trying to smash into the car in front of them. (Fortunately the cars have large, spring-loaded bumpers to prevent damage to the cars or passengers.) You'll find that the drivers at Tokyo Disneyland are much more courteous towards their fellow drivers, and seem to enjoy just driving the car around. Tokyo Disneyland's raceway has a nice feature you won't find in America: a "grandstands" section, where parents and race fans can sit and watch the cars go by while friends and family members are driving around. The grandstands are covered, a thoughtful idea considering how hot it is during the summer.